This article is about protein as nutrient. For protein as class of molecule, see protein. For other uses, see bodybuilding supplement. Amino acids are necessary nutrients. Present in every cell, they are also precursors to nucleic acids, co-enzymes, hormones, immune response, repair and other molecules essential for life. Proteins are essential nutrients for the human body. They are one of the building blocks of body tissue and can also serve as a fuel source. As a fuel, proteins provide as much energy density as carbohydrates: 4 kcal (17 kJ) per gram; in contrast, lipids provide 9 kcal (37 kJ) per gram. The most important aspect and defining characteristic of protein from a nutritional standpoint is its amino acid composition. Proteins are polymer chains made of amino acids linked together by peptide bonds. During human digestion, proteins are broken down in the stomach to smaller polypeptide chains via hydrochloric acid and protease actions. This is crucial for the absorption of the essential amino acids that cannot be biosynthesized by the body. There are nine essential amino acids which humans must obtain from their diet in order to prevent protein-energy malnutrition and resulting death. They are phenylalanine, valine, threonine, tryptophan, methionine, leucine, isoleucine, lysine, and histidine. There has been debate as to whether there are 8 or 9 essential amino acids. The consensus seems to lean towards 9 since histidine is not synthesized in adults. 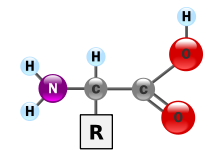 There are five amino acids which humans are able to synthesize in the body. These five are alanine, aspartic acid, asparagine, glutamic acid and serine. 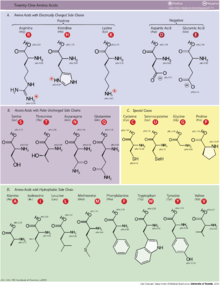 There are six conditionally essential amino acids whose synthesis can be limited under special pathophysiological conditions, such as prematurity in the infant or individuals in severe catabolic distress. These six are arginine, cysteine, glycine, glutamine, proline and tyrosine. Dietary sources of protein include both animals and plants: meats, dairy products, fish and eggs, as well as grains, legumes and nuts. Vegans can get enough essential amino acids by eating plant proteins. Protein is a nutrient needed by the human body for growth and maintenance. Aside from water, proteins are the most abundant kind of molecules in the body. Protein can be found in all cells of the body and is the major structural component of all cells in the body, especially muscle. This also includes body organs, hair and skin. Proteins are also used in membranes, such as glycoproteins. When broken down into amino acids, they are used as precursors to nucleic acid, co-enzymes, hormones, immune response, cellular repair, and other molecules essential for life. Additionally, protein is needed to form blood cells. Protein can be found in a wide range of food. The best combination of protein sources depends on the region of the world, access, cost, amino acid types and nutrition balance, as well as acquired tastes. Some foods are high in certain amino acids, but their digestibility and the anti-nutritional factors present in these foods make them of limited value in human nutrition. Therefore, one must consider digestibility and secondary nutrition profile such as calories, cholesterol, vitamins and essential mineral density of the protein source. On a worldwide basis, plant protein foods contribute over 60 percent of the per capita supply of protein, on average. In North America, animal-derived foods contribute about 70 percent of protein sources. 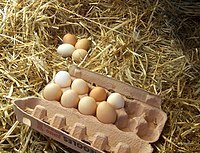 Meat, products from milk, eggs, soy, and fish are sources of complete protein. Whole grains and cereals are another source of proteins. However, these tend to be limiting in the amino acid lysine or threonine, which are available in other vegetarian sources and meats. Examples of food staples and cereal sources of protein, each with a concentration greater than 7.0%, are (in no particular order) buckwheat, oats, rye, millet, maize (corn), rice, wheat, sorghum, amaranth, and quinoa. Vegetarian sources of proteins include legumes, nuts, seeds and fruits. Legumes, some of which are called pulses in certain parts of the world, have higher concentrations of amino acids and are more complete sources of protein than whole grains and cereals. Examples of vegetarian foods with protein concentrations greater than 7 percent include soybeans, lentils, kidney beans, white beans, mung beans, chickpeas, cowpeas, lima beans, pigeon peas, lupines, wing beans, almonds, Brazil nuts, cashews, pecans, walnuts, cotton seeds, pumpkin seeds, hemp seeds, sesame seeds, and sunflower seeds. Food staples that are poor sources of protein include roots and tubers such as yams, cassava and sweet potato. Plantains, another major staple, are also a poor source of essential amino acids. Fruits, while rich in other essential nutrients, are another poor source of amino acids. The protein content in roots, tubers and fruits is between 0 and 2 percent. Food staples with low protein content must be complemented with foods with complete, quality protein content for a healthy life, particularly in children for proper development. The requirement for nonspecific nitrogen for the synthesis of the nutritionally dispensable amino acids (aspartic acid, asparagine, glutamic acid, alanine, serine) and other physiologically important nitrogen-containing compounds such as nucleic acids, creatine, and porphyrins. Healthy people eating a balanced diet rarely need protein supplements. The table below presents the most important food groups as protein sources, from a worldwide perspective. It also lists their respective performance as source of the commonly limiting amino acids, in milligrams of limiting amino acid per gram of total protein in the food source. The table reiterates the need for a balanced mix of foods to ensure adequate amino acid source. Protein source with highest density of respective amino acid. Protein source with lowest density of respective amino acid. Protein powders – such as casein, whey, egg, rice and soy – are processed and manufactured sources of protein. These protein powders may provide an additional source of protein for bodybuilders. The type of protein is important in terms of its influence on protein metabolic response and possibly on the muscle’s exercise performance. The different physical and/or chemical properties within the various types of protein may affect the rate of protein digestion. As a result, the amino acid availability and the accumulation of tissue protein is altered because of the various protein metabolic responses. The classic assays for protein concentration in food are the Kjeldahl method and the Dumas method. These tests determine the total nitrogen in a sample. The only major component of most food which contains nitrogen is protein (fat, carbohydrate and dietary fiber do not contain nitrogen). If the amount of nitrogen is multiplied by a factor depending on the kinds of protein expected in the food the total protein can be determined. This value is known as the “crude protein” content. On food labels the protein is given by the nitrogen multiplied by 6.25, because the average nitrogen content of proteins is about 16%. The Kjeldahl test is typically used because it is the method the AOAC International has adopted and is therefore used by many food standards agencies around the world, though the Dumas method is also approved by some standards organizations. Accidental contamination and intentional adulteration of protein meals with non-protein nitrogen sources that inflate crude protein content measurements have been known to occur in the food industry for decades. To ensure food quality, purchasers of protein meals routinely conduct quality control tests designed to detect the most common non-protein nitrogen contaminants, such as urea and ammonium nitrate. The testing method for protein in beef cattle feed has grown into a science over the post-war years. The standard text in the United States, Nutrient Requirements of Beef Cattle, has been through eight editions over at least seventy years. The 1996 sixth edition substituted for the fifth edition’s crude protein the concept of “metabolizeable protein“, which was defined around the year 2000 as “the true protein absorbed by the intestine, supplied by microbial protein and undegraded intake protein”. The limitations of the Kjeldahl method were at the heart of the Chinese protein export contamination in 2007 and the 2008 China milk scandal in which the industrial chemical melamine was added to the milk or glutens to increase the measured “protein”. The most important aspect and defining characteristic of protein from a nutritional standpoint is its amino acid composition. There are multiple systems which rate proteins by their usefulness to an organism based on their relative percentage of amino acids and, in some systems, the digestibility of the protein source. They include biological value, net protein utilization, and PDCAAS (Protein Digestibility Corrected Amino Acids Score) which was developed by the FDA as a modification of the Protein efficiency ratio (PER) method. The PDCAAS rating was adopted by the US Food and Drug Administration (FDA) and the Food and Agricultural Organization of the United Nations/World Health Organization (FAO/WHO) in 1993 as “the preferred ‘best'” method to determine protein quality. These organizations have suggested that other methods for evaluating the quality of protein are inferior. In 2013 FAO proposed changing to Digestible Indispensable Amino Acid Score. Most proteins are decomposed to single amino acids by digestion in the gastro-intestinal tract. Digestion typically begins in the stomach when pepsinogen is converted to pepsin by the action of hydrochloric acid, and continued by trypsin and chymotrypsin in the small intestine. Before the absorption in the small intestine, most proteins are already reduced to single amino acid or peptides of several amino acids. Most peptides longer than four amino acids are not absorbed. Absorption into the intestinal absorptive cells is not the end. There, most of the peptides are broken into single amino acids. Absorption of the amino acids and their derivatives into which dietary protein is degraded is done by the gastrointestinal tract. The absorption rates of individual amino acids are highly dependent on the protein source; for example, the digestibilities of many amino acids in humans, the difference between soy and milk proteins and between individual milk proteins, beta-lactoglobulin and casein. For milk proteins, about 50% of the ingested protein is absorbed between the stomach and the jejunum and 90% is absorbed by the time the digested food reaches the ileum. Biological value (BV) is a measure of the proportion of absorbed protein from a food which becomes incorporated into the proteins of the organism’s body. Newborns of mammals are exceptional in protein digestion and assimilation in that they can absorb intact proteins at the small intestine. This enables passive immunity, i.e., transfer of immunoglobulins from the mother to the newborn, via milk. Considerable debate has taken place regarding issues surrounding protein intake requirements. The amount of protein required in a person’s diet is determined in large part by overall energy intake, the body’s need for nitrogen and essential amino acids, body weight and composition, rate of growth in the individual, physical activity level, the individual’s energy and carbohydrate intake, and the presence of illness or injury. Physical activity and exertion as well as enhanced muscular mass increase the need for protein. Requirements are also greater during childhood for growth and development, during pregnancy, or when breastfeeding in order to nourish a baby or when the body needs to recover from malnutrition or trauma or after an operation. If not enough energy is taken in through diet, as in the process of starvation, the body will use protein from the muscle mass to meet its energy needs, leading to muscle wasting over time. If the individual does not consume adequate protein in nutrition, then muscle will also waste as more vital cellular processes (e.g., respiration enzymes, blood cells) recycle muscle protein for their own requirements. According to US & Canadian Dietary Reference Intake guidelines, women aged 19–70 need to consume 46 grams of protein per day while men aged 19–70 need to consume 56 grams of protein per day to minimize risk of deficiency. These Recommended Dietary Allowances (RDAs) were calculated based on 0.8 grams protein per kilogram body weight and average body weights of 57 kg (126 pounds) and 70 kg (154 pounds), respectively. However, this recommendation is based on structural requirements but disregards use of protein for energy metabolism. This requirement is for a normal sedentary person. In the United States, average protein consumption is higher than the RDA. According to results of the National Health and Nutrition Examination Survey (NHANES 2013-2014), average protein consumption for women ages 20 and older was 69.8 grams and for men 98.3 grams/day. Several studies have concluded that active people and athletes may require elevated protein intake (compared to 0.8 g/kg) due to increase in muscle mass and sweat losses, as well as need for body repair and energy source. Suggested amounts vary from 1.2-1.4 g/kg for those doing endurance exercise to as much as 1.6-1.8 g/kg for strength exercise, while a proposed maximum daily protein intake would be approximately 25% of energy requirements i.e. approximately 2 to 2.5 g/kg. However, many questions still remain to be resolved. In addition, some have suggested that athletes using restricted-calorie diets for weight loss should further increase their protein consumption, possibly to 1.8–2.0 g/kg, in order to avoid loss of lean muscle mass. Endurance athletes differ from strength-building athletes in that endurance athletes do not build as much muscle mass from training as strength-building athletes do. Research suggests that individuals performing endurance activity require more protein intake than sedentary individuals so that muscles broken down during endurance workouts can be repaired. Although the protein requirement for athletes still remains controversial (for instance see Lamont, Nutrition Research Reviews, pages 142 – 149, 2012), research does show that endurance athletes can benefit from increasing protein intake because the type of exercise endurance athletes participate in still alters the protein metabolism pathway. The overall protein requirement increases because of amino acid oxidation in endurance-trained athletes. Endurance athletes who exercise over a long period (2–5 hours per training session) use protein as a source of 5–10% of their total energy expended. Therefore, a slight increase in protein intake may be beneficial to endurance athletes by replacing the protein lost in energy expenditure and protein lost in repairing muscles. One review concluded that endurance athletes may increase daily protein intake to a maximum of 1.2–1.4 g per kg body weight. Research also indicates that individuals performing strength-training activity require more protein than sedentary individuals. Strength-training athletes may increase their daily protein intake to a maximum of 1.4–1.8 g per kg body weight to enhance muscle protein synthesis, or to make up for the loss of amino acid oxidation during exercise. Many athletes maintain a high-protein diet as part of their training. In fact, some athletes who specialize in anaerobic sports (e.g., weightlifting) believe a very high level of protein intake is necessary, and so consume high protein meals and also protein supplements. A food allergy is an abnormal immune response to proteins in food. The signs and symptoms may range from mild to severe. They may include itchiness, swelling of the tongue, vomiting, diarrhea, hives, trouble breathing, or low blood pressure. These symptoms typically occurs within minutes to one hour after exposure. When the symptoms are severe, it is known as anaphylaxis. The following eight foods are responsible for about 90% of allergic reactions: cow’s milk, eggs, wheat, shellfish, fish, peanuts, tree nuts and soy. While there is no conclusive evidence that a high protein diet can cause chronic kidney disease, there is a consensus that people with this disease should decrease consumption of protein. According to one 2009 review, people with chronic kidney disease who reduce protein consumption have a 32% lower risk of death in comparison to affected people who do not make these dietary changes. [needs update] Moreover, people with this disease while using a low protein diet (0.6 g/kg/d – 0.8 g/kg/d) may develop metabolic compensations that preserve kidney function, although in some people, malnutrition may occur. Individuals with phenylketonuria (PKU) must keep their intake of phenylalanine – an essential amino acid – extremely low to prevent a mental disability and other metabolic complications. Phenylalanine is a component of the artificial sweetener aspartame, so people with PKU need to avoid low calorie beverages and foods with this ingredient. Maple syrup urine disease is associated with genetic anomalies in the metabolism of branched-chain amino acids (BCAAs). They have high blood levels of BCAAs and must severely restrict their intake of BCAAs in order to prevent mental retardation and death. The amino acids in question are leucine, isoleucine and valine. The condition gets its name from the distinctive sweet odor of affected infants’ urine. Children of Amish, Mennonite, and Ashkenazi Jewish descent have a high prevalence of this disease compared to other populations. The U.S. and Canadian Dietary Reference Intake review for protein concluded that there was not sufficient evidence to establish a Tolerable upper intake level, i.e., an upper limit for how much protein can be safely consumed. When amino acids are in excess of needs, the liver takes up the amino acids and deaminates them, a process converting the nitrogen from the amino acids into ammonia, further processed in the liver into urea via the urea cycle. Excretion of urea occurs via the kidneys. Other parts of the amino acid molecules can be converted into glucose and used for fuel. When food protein intake is periodically high or low, the body tries to keep protein levels at an equilibrium by using the “labile protein reserve” to compensate for daily variations in protein intake. However, unlike body fat as a reserve for future caloric needs, there is no protein storage for future needs. Excessive protein intake may increase calcium excretion in urine, occurring to compensate for the pH imbalance from oxidation of sulfur amino acids. This may lead to a higher risk of kidney stone formation from calcium in the renal circulatory system. One meta-analysis reported no adverse effects of higher protein intakes on bone density. Another meta-analysis reported a small decrease in systolic and diastolic blood pressure with diets higher in protein, with no differences between animal and plant protein. High protein diets have been shown to lead to an additional 1.21 kg of weight loss over a period of 3 months versus a baseline protein diet in a meta-analysis. Benefits of decreased body mass index as well as HDL cholesterol were more strongly observed in studies with only a slight increase in protein intake rather where high protein intake was classified as 45% of total energy intake. Detrimental effects to cardiovascular activity were not observed in short-term diets of 6 months or less. There is little consensus on the potentially detrimental effects to healthy individuals of a long-term high protein diet, leading to caution advisories about using high protein intake as a form of weight loss. The 2015–2020 Dietary Guidelines for Americans (DGA) recommends that men and teenage boys increase their consumption of fruits, vegetables and other under-consumed foods, and that a means of accomplishing this would be to reduce overall intake of protein foods. The 2015 – 2020 DGA report does not set a recommended limit for the intake of red and processed meat. While the report acknowledges research showing that lower intake of red and processed meat is correlated with reduced risk of cardiovascular diseases in adults, it also notes the value of nutrients provided from these meats. The recommendation is not to limit intake of meats or protein, but rather to monitor and keep within daily limits the sodium (< 2300 mg), saturated fats (less than 10% of total calories per day), and added sugars (less than 10% of total calories per day) that may be increased as a result of consumption of certain meats and proteins. While the 2015 DGA report does advise for a reduced level of consumption of red and processed meats, the 2015-2020 DGA key recommendations recommend that a variety of protein foods be consumed, including both vegetarian and non-vegetarian sources of protein. Protein deficiency and malnutrition (PEM) can lead to variety of ailments including mental retardation and kwashiorkor. Symptoms of kwashiorkor include apathy, diarrhea, inactivity, failure to grow, flaky skin, fatty liver, and edema of the belly and legs. This edema is explained by the action of lipoxygenase on arachidonic acid to form leukotrienes and the normal functioning of proteins in fluid balance and lipoprotein transport. PEM is fairly common worldwide in both children and adults and accounts for 6 million deaths annually. In the industrialized world, PEM is predominantly seen in hospitals, is associated with disease, or is often found in the elderly. ^ a b c Hermann, Janice R. “Protein and the Body” (PDF). Oklahoma Cooperative Extension Service, Division of Agricultural Sciences and Natural Resources • Oklahoma State University: T–3163–1 – T–3163–4. ^ a b c Genton L, Melzer K, Pichard C (August 2010). “Energy and macronutrient requirements for physical fitness in exercising subjects”. Clinical Nutrition. 29 (4): 413–23. doi:10.1016/j.clnu.2010.02.002. PMID 20189694. ^ Young VR (August 1994). “Adult amino acid requirements: the case for a major revision in current recommendations” (PDF). The Journal of Nutrition. 124 (8 Suppl): 1517S–1523S. doi:10.1093/jn/124.suppl_8.1517S. PMID 8064412. ^ Rosane Oliveira, “The Essentials–Part One”, UC Davis Integrative Medicine, Feb 4, 2016. July 12, 2017. ^ Kopple JD, Swendseid ME (May 1975). “Evidence that histidine is an essential amino acid in normal and chronically uremic man”. The Journal of Clinical Investigation. 55 (5): 881–91. doi:10.1172/jci108016. PMC 301830. PMID 1123426. ^ a b “Protein in diet”. United States National Library of Medicine, National Institutes of Health. 2009. ^ a b c d e Young VR, Pellett PL (May 1994). “Plant proteins in relation to human protein and amino acid nutrition” (PDF). The American Journal of Clinical Nutrition. 59 (5 Suppl): 1203S–1212S. doi:10.1093/ajcn/59.5.1203s. PMID 8172124. ^ Steinke W, et al. (1992). New protein foods in human health: nutrition, prevention and therapy. CRC Press. pp. 91–100. ISBN 978-0-8493-6904-9. ^ a b c Amino acid content of foods and biological data on proteins (FAO nutritional studies number 24). Food and Agriculture Organization. 1985. ISBN 978-92-5-001102-8. ^ a b Michael C. Latham (1997). “Human nutrition in the developing world”. Food and Agriculture Organization of the United Nations. ^ a b c d e Lemon PW (June 1995). “Do athletes need more dietary protein and amino acids?”. International Journal of Sport Nutrition. 5 Suppl: S39–61. PMID 7550257. ^ D. Julian McClements. “Analysis of Proteins”. University of Massachusetts Amherst. Retrieved 27 April 2007. ^ Weise, Elizabeth (24 April 2007). “Food tests promise tough task for FDA”. USA Today. Retrieved 29 April 2007. ^ VanRaden PM, Powell RL. “Genetic evaluations for true protein”. 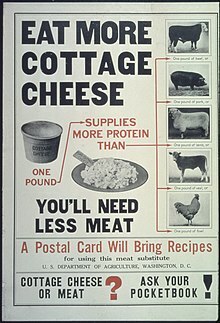 United States Department of Agriculture. Retrieved 27 April 2007. ^ Snyder, Alison (August 2007). “Protein Pretense: Cheating the standard protein tests is easy, but industry hesitates on alternatives”. Scientific American. Retrieved 9 November 2007. ^ “Food energy – methods of analysis and conversion factors”. FAO. Retrieved 9 November 2007. ^ Stephen Chen (18 September 2008). “Melamine – an industry staple”. South China Morning Post. pp. Page A2. ^ Moore JC, DeVries JW, Lipp M, Griffiths JC, Abernethy DR (17 August 2010). “Total Protein Methods and Their Potential Utility to Reduce the Risk of Food Protein Adulteration”. Comprehensive Reviews in Food Science and Food Safety. 9 (4): 330–357. doi:10.1111/j.1541-4337.2010.00114.x. ^ Gaudichon C, Bos C, Morens C, Petzke KJ, Mariotti F, Everwand J, Benamouzig R, Daré S, Tomé D, Metges CC (July 2002). “Ileal losses of nitrogen and amino acids in humans and their importance to the assessment of amino acid requirements”. Gastroenterology. 123 (1): 50–9. doi:10.1053/gast.2002.34233. PMID 12105833. ^ Mahé S, Roos N, Benamouzig R, Davin L, Luengo C, Gagnon L, Gaussergès N, Rautureau J, Tomé D (April 1996). “Gastrojejunal kinetics and the digestion of [15N]beta-lactoglobulin and casein in humans: the influence of the nature and quantity of the protein”. The American Journal of Clinical Nutrition. 63 (4): 546–52. doi:10.1093/ajcn/63.4.546. PMID 8599318. ^ Mahé S, Marteau P, Huneau JF, Thuillier F, Tomé D (February 1994). “Intestinal nitrogen and electrolyte movements following fermented milk ingestion in man”. The British Journal of Nutrition. 71 (2): 169–80. doi:10.1079/BJN19940124. PMID 8142329. ^ Hurley WL, Theil PK (April 2011). “Perspectives on immunoglobulins in colostrum and milk”. Nutrients. 3 (4): 442–74. doi:10.3390/nu3040442. PMC 3257684. PMID 22254105. ^ a b c d Bilsborough S, Mann N (April 2006). “A review of issues of dietary protein intake in humans”. International Journal of Sport Nutrition and Exercise Metabolism. 16 (2): 129–52. doi:10.1123/ijsnem.16.2.129. PMID 16779921. ^ a b c d Lemon PW (October 2000). “Beyond the zone: protein needs of active individuals”. Journal of the American College of Nutrition. 19 (5 Suppl): 513S–521S. doi:10.1080/07315724.2000.10718974. PMID 11023001. ^ WHO, FAO, UNU (2007). “Protein and amino acid requirements in human nutrition” (PDF). WHO Press. Retrieved 8 July 2008. ^ a b c Tarnopolsky MA, Atkinson SA, MacDougall JD, Chesley A, Phillips S, Schwarcz HP (November 1992). “Evaluation of protein requirements for trained strength athletes”. Journal of Applied Physiology. 73 (5): 1986–95. doi:10.1152/jappl.1992.73.5.1986. PMID 1474076. ^ Phillips SM, Van Loon LJ (2011-01-01). “Dietary protein for athletes: from requirements to optimum adaptation”. Journal of Sports Sciences. 29 Suppl 1 (sup1): S29–38. doi:10.1080/02640414.2011.619204. PMID 22150425. ^ a b c Phillips SM (December 2006). “Dietary protein for athletes: from requirements to metabolic advantage”. Applied Physiology, Nutrition, and Metabolism = Physiologie Appliquee, Nutrition et Metabolisme. 31 (6): 647–54. doi:10.1139/H06-035. PMID 17213878. ^ Nutrition for Athletes, International Olympic Committee Nutrition Working Group of the Medical and Scientific Commission of the International Olympic Committee, Revised and Updated in June 2016. ^ National Institute of Allergy and Infectious Diseases (July 2012). “Food Allergy An Overview” (PDF). Archived from the original (PDF) on 2016-03-05. ^ Fouque D, Laville M (July 2009). “Low protein diets for chronic kidney disease in non diabetic adults”. The Cochrane Database of Systematic Reviews (3): CD001892. doi:10.1002/14651858.CD001892.pub3. PMID 19588328. ^ a b Schwingshackl L, Hoffmann G (2014). “Comparison of high vs. normal/low protein diets on renal function in subjects without chronic kidney disease: a systematic review and meta-analysis”. PLOS One. 9 (5): e97656. doi:10.1371/journal.pone.0097656. PMC 4031217. PMID 24852037. ^ “phenylketonuria”. Genetics Home Reference. September 8, 2016. Archived from the original on 27 July 2016. Retrieved 12 September 2016. ^ Ten Have GA, Engelen MP, Luiking YC, Deutz NE (August 2007). “Absorption kinetics of amino acids, peptides, and intact proteins”. International Journal of Sport Nutrition and Exercise Metabolism. 17 Suppl: S23–36. PMID 18577772. ^ Gropper SS, Smith JL, Groff JL (2009). Advanced nutrition and human metabolism. Belmont, CA: Wadsworth Cengage Learning. ISBN 978-0-495-11657-8. ^ Shams-White MM, Chung M, Du M, Fu Z, Insogna KL, Karlsen MC, LeBoff MS, Shapses SA, Sackey J, Wallace TC, Weaver CM (June 2017). “Dietary protein and bone health: a systematic review and meta-analysis from the National Osteoporosis Foundation”. The American Journal of Clinical Nutrition. 105 (6): 1528–1543. doi:10.3945/ajcn.116.145110. PMID 28404575. ^ Rebholz CM, Friedman EE, Powers LJ, Arroyave WD, He J, Kelly TN (October 2012). “Dietary protein intake and blood pressure: a meta-analysis of randomized controlled trials”. American Journal of Epidemiology. 176 Suppl 7: S27–43. doi:10.1093/aje/kws245. PMID 23035142. ^ a b c Santesso N, Akl EA, Bianchi M, Mente A, Mustafa R, Heels-Ansdell D, Schünemann HJ (July 2012). “Effects of higher- versus lower-protein diets on health outcomes: a systematic review and meta-analysis”. European Journal of Clinical Nutrition. 66 (7): 780–8. doi:10.1038/ejcn.2012.37. PMC 3392894. PMID 22510792. ^ Schwingshackl L, Hoffmann G (2014). “Comparison of high vs. normal/low protein diets on renal function in subjects without chronic kidney disease: a systematic review and meta-analysis”. PLOS One. 9 (5): e97656. doi:10.1371/journal.pone.0097656. PMC 4031217. PMID 24852037. ^ Ko GJ, Obi Y, Tortorici AR, Kalantar-Zadeh K (January 2017). “Dietary protein intake and chronic kidney disease”. Current Opinion in Clinical Nutrition and Metabolic Care. 20 (1): 77–85. doi:10.1097/MCO.0000000000000342. PMC 5962279. PMID 27801685. ^ Agata, Dabrowska (2016-02-02). “Dietary Guidelines for Americans: Frequently Asked Questions”. Digital Library. ^ “Marasmus and Kwashiorkor”. Medscape Reference. May 2009. ^ Schwartz J, Bryant CA, DeWalt KM, Courtney A (2003). The cultural feast: an introduction to food and society. Belmont, California: Thomson/Wadsworth. pp. 282, 283. ISBN 978-0-534-52582-8.